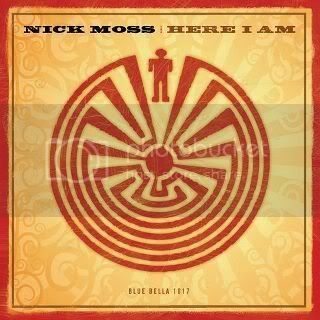 Nick Moss will release his ninth album Here I Am on November 22 through his Blue Bella Records label and has announced the full tracklisting for the set and released artwork for the new album. Moss’ last album, Privileged, was the most commercially and critically successful of his career and yet was a marked departure from the string of great traditional Chicago blues records he recorded with his band, The Flip Tops. Here I Am starts where Privileged left off and goes even further in terms of arrangement, sound, and style. The new set features 11 tracks: 10 new Moss originals and the "It'll Turn Around" radio edit. He is backed on Here I Am by his most versatile lineup yet, beginning with keyboard/organist Travis Reed, who joined shortly after Privileged was recorded, making him the veteran. Newcomers Michael Ledbetter and Patrick Seals provided guitar/backing vocals and drums, respectively while bass duties on Here I Am were handled by Nik Skilnik and “Stumpy” Hutchkins. Backing vocalists Shuree Rivera and Jennifer Evans are also present on several tracks, bringing a dynamic not previously heard on Moss’ records. Matthew Wilson has taken over bass and backing vocal duties for the tour, which is already underway in advance of the album’s release. I don’t want to give too much away too early but I’ve listening to the record for over a month and actually heard multiple versions of what wound up being the first single, “It’ll Turn Around.” This is Moss’ most diverse record to date and if you happen to love jamming and great guitar leads, you’re in for a treat because Here I Am delivers that and more. “It’ll Turn Around” is still streaming and picked up a ton of listens in just its first week of release. “Candy Nation” has been tabbed as the second single from the record and is slated for release soon. 1. Why You So Mean?